Dr. Emery recommends Fluoridex to our patients with tooth sensitivity! One of Dr. Emery’s favorite home care products is Philips Sonicare Fluoridex toothpaste. It is a product that our staff truly believes in; Dr. Emery and I both use it in our own homes. 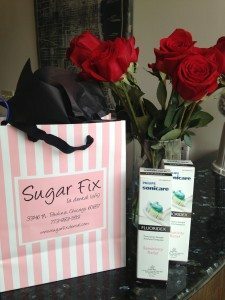 What is so special about this dentifrice compared to the countless other options that you can find at any department or drug store? Fluoridex is a prescription-strength fluoride toothpaste that promotes strengthening and prevents demineralization of enamel (your tooth’s outermost layer) offering you increased protection from decay compared to over-the-counter products. We often recommend it to any patient who has a history of having cavities between the teeth because it offers 4x the amount of fluoride as traditional paste, while maintaining a pleasant fruit or mint flavor that our patients absolutely love! Patients are instructed to use the paste at least once daily (although Dr. Emery uses it both in the morning and evening) and are told not to eat, drink, or rinse after brushing. The paste will leave a slight film over the teeth, allowing the magic to happen! Ideally, patients would brush with this high-fluoride toothpaste in the evenings immediately before bedtime. There are several brands of prescription fluoride toothpaste on the market, and each of these products are great in their own ways! We also recommend Clinpro 5000 toothpaste to our patients, as it is comparable to the Philips product. No matter which type of dentifrice you use, we want to make sure your smile is healthy for many years to come! Ask me about our recommended products at your next hygiene visit!